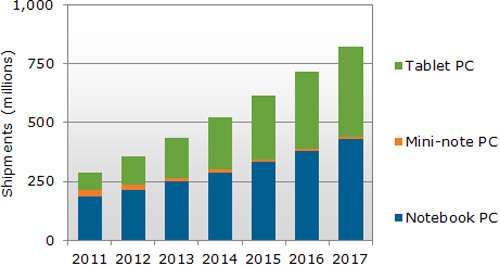 Tablets numbers are growing and growing despite product bombs such as the HP TouchPad and RIM PlayBook. The NPD Group, a sales and market research company in the U.S., is predicting that tablets may even outdo notebooks in shipment numbers five years down the line. The estimates, according to Electronista, are based on a 256 percent and 12 percent growth of tablets and notebooks this year, respectively. Therefore, by 2017, there could be a total of 383.3 million tablets shipped, or about 50 million units less than expected notebook numbers. High resolution displays, portability and additional features are expected to be the driving force of future tablet sales. The NPD division made even more bold claims about notebooks in general. The group believes that netbooks will continue to dwindle in sales, but that notebooks would be kept alive by the eventual low prices, long battery lives and small sizes of Ultrabooks. Still, such dramatic trends should be taken with a grain of salt as Ultrabooks and tablets are in their infant stages. To predict their respective futures and possible influences on the market over five years down the line at this point in their early lives would produce extremely volatile results.